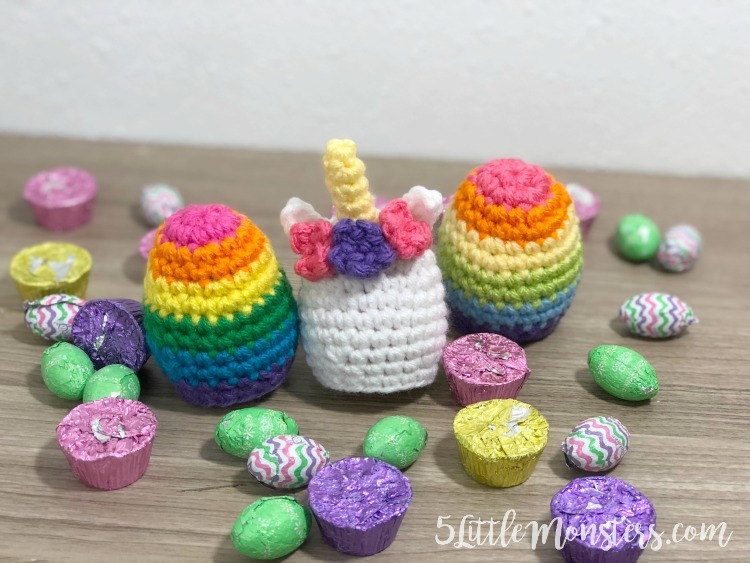 For this set I made a unicorn egg cover, as well as a coordinating rainbow cover. 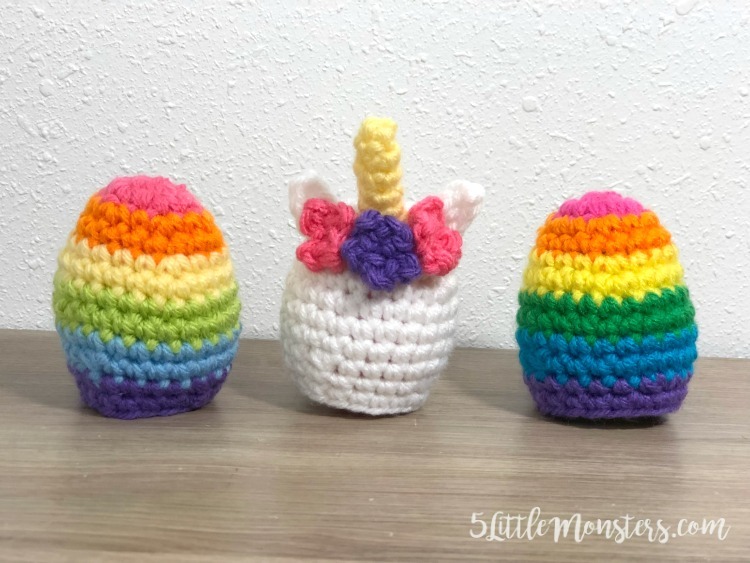 The unicorn has ears, a horn, and flowers stitched on. 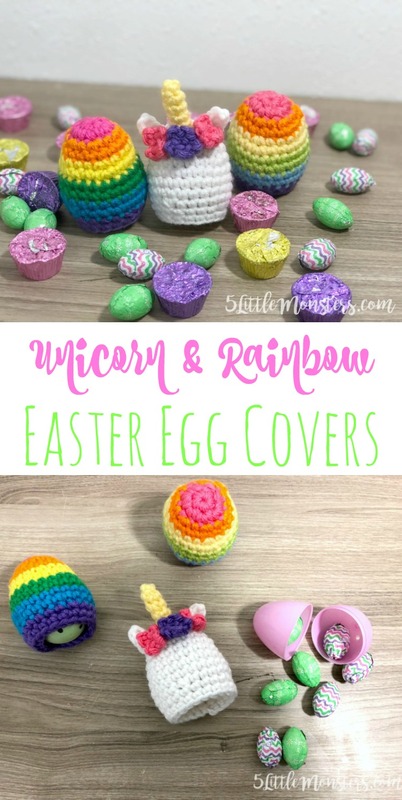 They rainbow cover is just simple stripes. I did a couple different versions of the rainbow, one with brighter colors and one a little lighter, just to play around a little bit with the colors. The egg covers are open on the bottom and they slide right over the plastic egg, pointier side of the egg up. To remove the egg from the cover simply sqeeze and they egg will come out. 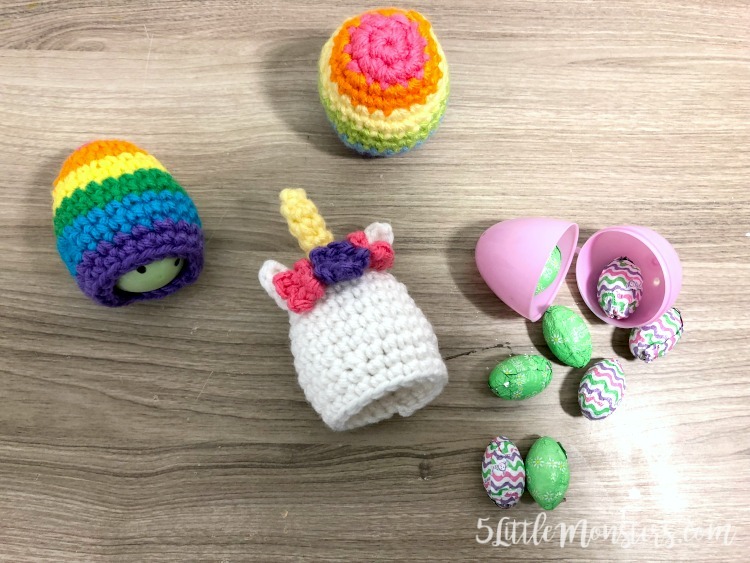 Such a fun way to dress up a simple egg and make the whole basket a little more fun. 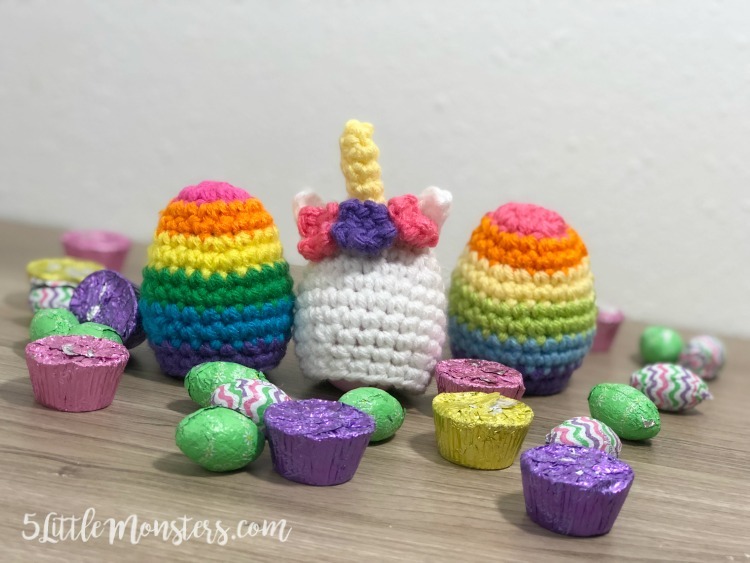 Both the rainbow and unicorn eggs use the same basic egg pattern, it is the same pattern that I used for the bunny, chick, and lamb. The only difference is that in order to have the stripes line up I chose to join each round where the others are all worked in a spiral. 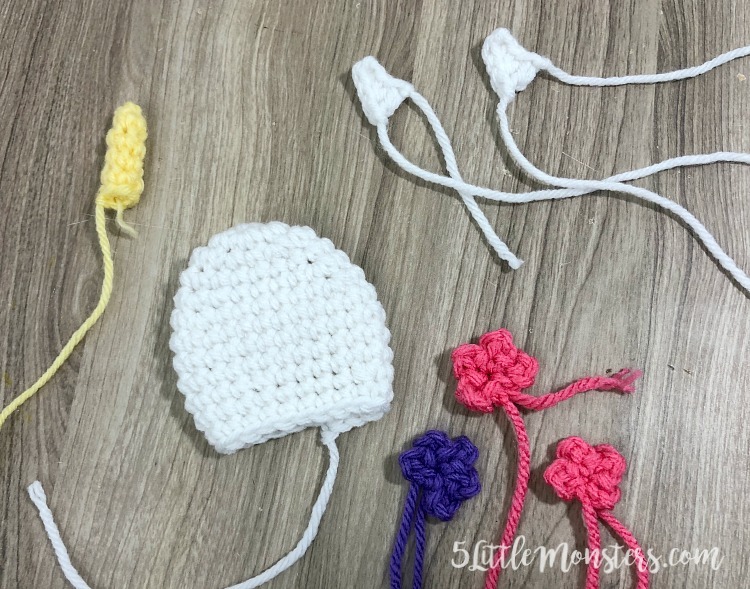 I change my color in the last stitch of the round before the color change, when working the last sc of the round instead of pulling through a loop of the same color, pull through a loop of the new color. You could stitch eyes on the front if you want, I chose to leave mine plain. If you do stitch eyes on I would recommend using embroidery floss rather than yarn because they are so small. 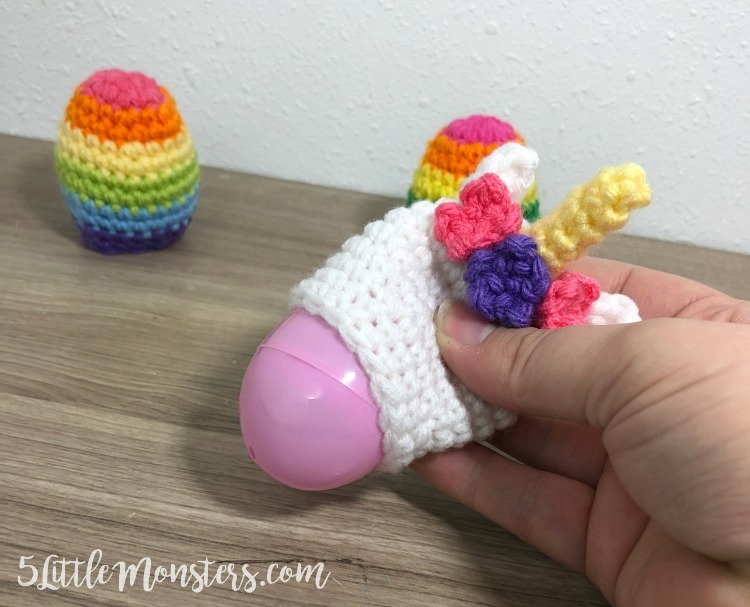 Fill eggs with treats and put inside the covers with the pointy side up.